This is a fun recipe for a nutella jar cake which I made for my nutella loving daughter. 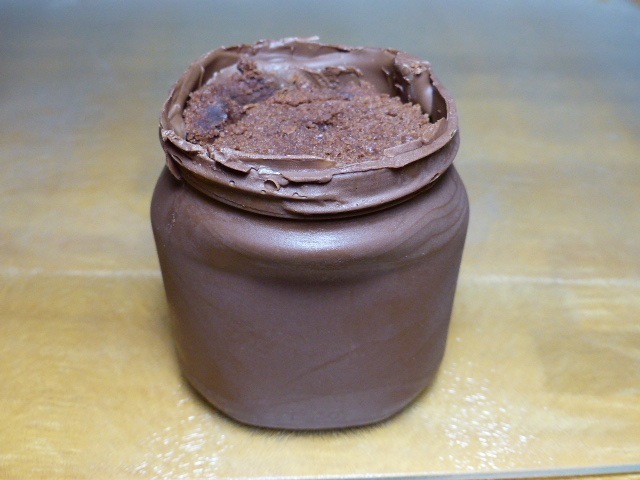 The cake jar is cast from chocolate and filled with nutella cupcakes which have a chewy fudge texture. I used cupcakes because they just fitted into the chocolate case perfectly. 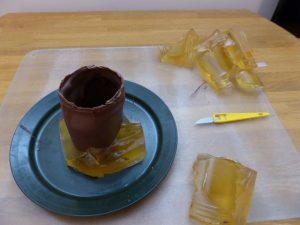 I wanted to make an exact replica of the nutella jar, but to make a mould directly out of the jar was difficult as most nutella jars are made from glass and therefore not easy to cut in half to form a mould. 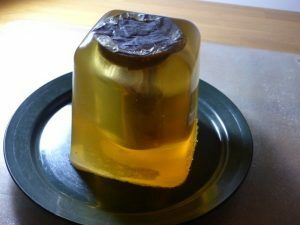 The obvious alternative to cutting the jar was to make a mould from food grade silicone, but this was expensive for a oneoff cake. 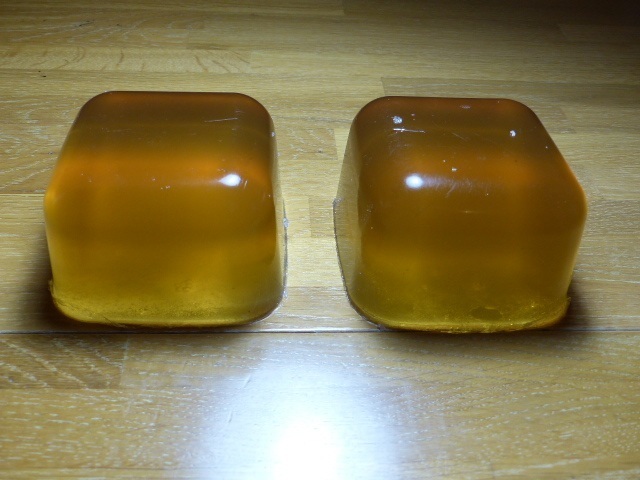 After some research I discovered a few references to gelatine being used to make chocolate moulds and further research led to the addition of glycerine to make the moulding material more resilient. The use of gelatine / glycerin moulding material seems to be quite common when making sfx prosthetics. For me this was the first time I have used a gelatine mould to cast chocolate and it turned out great. The material is really easy to work with and if you get it wrong just melt it down and start again. 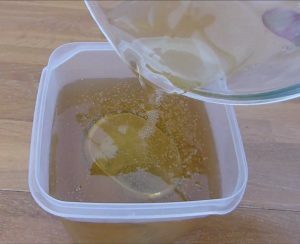 If the mixture contains lumps then microwave it on full power for 30 seconds at a time until the mixture melts and then let it set again. Now that we have two batches of the moulding material we can prepare the nutella jar as a pattern ready to make the mould. The nutella jar must be sealed and heavy enough so that it doesn’t float in the moulding liquid. 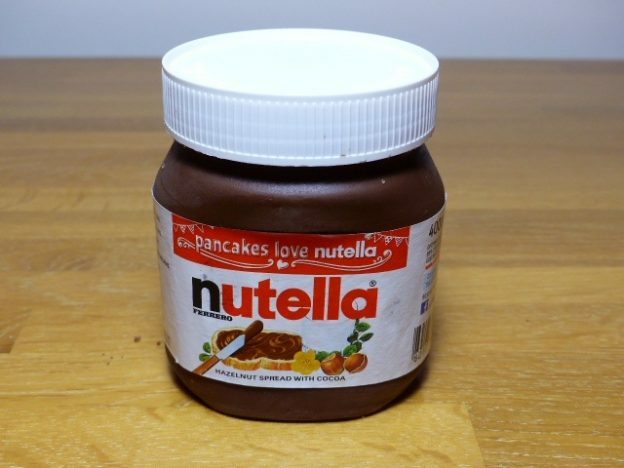 If you’re using a new unopened jar of nutella then the weight of the nutella and the foil seal are good enough, so simply remove the plastic lid and the label. If the jar has already been used then we need to add some weight and seal the top. 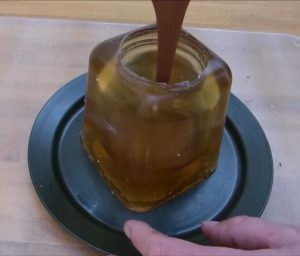 Once the nutella jar has been prepared then we need a container to put it in that can hold the liquid moulding material and allow plenty of space around the nutella jar. 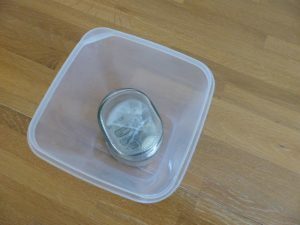 The container that I used came from an Ikea pruta container set. Place the sealed nutella jar upside down into the container. Once the moulding material is set then use a blunt knife to help free the mould from the container. 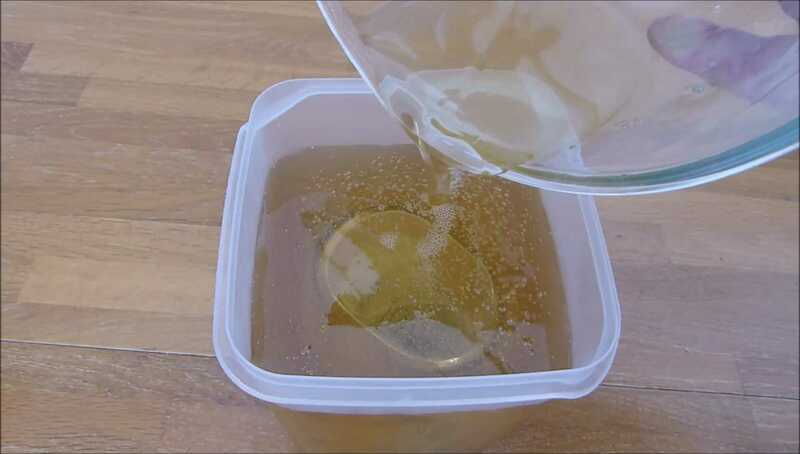 This process does require care but you’ll find that the mixture is tough and flexible. It doesn’t matter if you get splits in the top section. Now that the mould is ready we are going to melt 150g of milk chocolate ready to pour into it. Grate the chocolate to make it easier to melt. Microwave two-thirds of it on full power in short 15-second bursts stirring each time until it’s just melted. and then give it a final 10 second burst in the microwave. Pour the chocolate into the mould and rotate it around until the inside surfaces are coated. Repeat this process several times, leaving the chocolate to set inbetween. Cover the mould and leave it in the refrigerator for the chocolate to set. Once the chocolate is set cut away the mould with a sharp knife. The moulding material is reusable and lasts a long time in the refrigerator, so don’t throw it away; just melt it down and use it again. 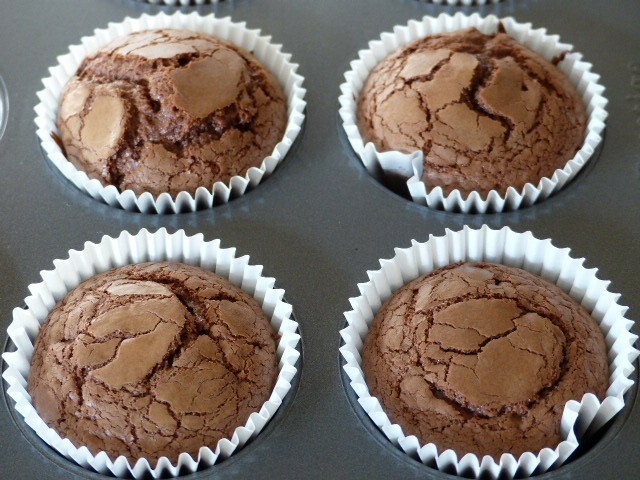 Now we are going to make some nutella cupcakes to put inside the chocolate jar. Once the cupcakes have cooled completely, we can use them to fill the chocolate nutella jar, layering inbetween with additional nutella spread, adding cupcakes and nutella until the jar is full. Finally attach the nutella label and screw on the plastic lid. As an alternative to the plastic lid you can cast it in white chocolate in the same way as the jar. You should now have a very good copy of the nutella lid and you can trim the top of the chocolate nutella jar to fit them together. This entry was posted in Recipes and tagged cake, chocolate, gelatine, glycerine, mould, nutella, recipe on June 8, 2016 by techydiy.